Explore NinjaTrader’s Order Flow + suite of premium features for NinjaTrader 8. This tool set helps traders identify buying and selling pressure through the analysis and visualization of trade activity. Cumulative Delta – Plot the underlying order flow to uncover the battle between buyers and sellers. Market Depth Map – Gain clear insight of market depth & order flow with a historic and real-time visualization of the limit order book. Order Flow Trade Detector – Analyze the tape and visualize significant trade events on a chart. VWAP – Plot the volume-weighted average price of a market to identify potential buy/sell signals & support/resistance levels. 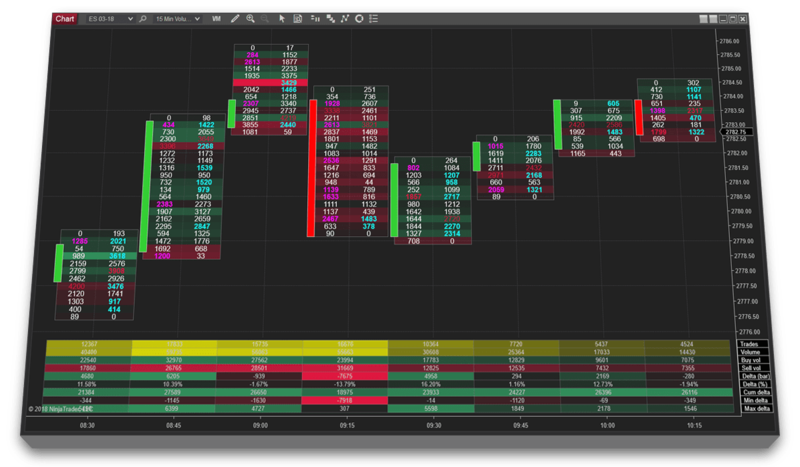 Volumetric Bars – Track buyers and sellers tick by tick & gain a comprehensive view of the trading action as it unfolds.